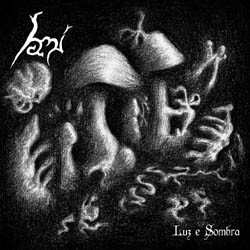 Iamí is a new band from Maringá of Brazil combining black metal with dungeon synth music. It is the personal project of Iamí, whose name means “night” in the ancient indigenous Tupi language. The band’s first release was the demo single “Crença Profana” that was out on July 2013. Finally on October 2014 Iamí self-released its debut full-length album, entitled “Luz e Sombra“, which translates to “Light and Shadow” in Brazilian – Portuguese. Since its beginning, the band’s intention was to play black metal, enriched with dungeon synth atmospheric elements. Dungeon synth is a genre I see a lot lately, but never actually got into it. Iamí however make a very good effort to combine it with black metal and the result is very interesting. “Luz e Sombra” includes 6 songs and its total duration is almost 58 minutes. 2 of the songs, including the 20-min closing track “Quietude“, move completely on the dungeon synth side, so the album is practically divided equally between these 2 “genres”. This contrast between the tranquility of synths to the raw sound of black metal seems to be one of the main ideas of the band, something that is also depicted on the black & white artwork and the album title. I’d like to comment more on the beautiful artwork, painted by Iamí himself. The cover plays perfectly with the light and darkness, the abstract and specific, the ethereal and organic, following the atmosphere and lyrical concept of the music that moves from ancient shamanism practices, spirituality, nature, human consciousness meditation and personal transcendental experiences. The two dungeon synth compositions move in a slow repetitive style, similar to the dark ambient genre. Lengthy background chords, with really slow changes, interrupted by few melodic notes here and there, create the typical atmospheric sound of the genre, which is ideal if you want to have a background that allows you to focus on other spiritual activities… For my personal taste, the other half of the album is much more interesting and definitely more versatile. Their black metal, has a quite personal sound, trying to balance between the band’s different influences. Just try to imagine a mixture of mid paced raw black metal, rhythmic distorted guitar riffs, doom drone metal elements, acoustic guitars and the “dull” dark atmosphere of dungeon synth. And while “Luz e Sombra” moves mostly in mid to slow tempo, there are also some faster extreme outbreaks, with best example the shortest and most extreme song of the album, the 3-minute track “Lamento“. The overall sound quality and aesthetic is perfect for the album’s atmosphere and taking into consideration that the album was produced with very few resources and was recorded in a small room, the result is more than satisfying. The vocals are extreme black metal screams, sang in Iamí’s native language, except for “Lamento” that instead of lyrics, it has inarticulate cries (really atmospheric)! Of course the two dungeon synth songs are instrumental. Iamí is a very interesting band, quite different from the majority of the stuff I usually listen to. Without sounding melodic, in the typical meaning of the word, the band manages to create a very atmospheric and personal sound. Currently Iamí is very busy with his new ambitious project, the dungeon synth magazine “Masmorra“, but he will soon return to compose new songs for the band. “Luz e Sombra” is self-released in a gatefold card case CD including all the lyrics, limited to only 300 copies. Of course it also also available digitally in the band’s official Bandcamp page, that you can check below.